Adventure, mystery, and monsters converge in this fast-paced middle grade series perfect for fans of Goosebumps, Cirque du Freak, the Cooper Kids, and the Hardy Boys. Twelve-year-old Alec Kerley finds out, in an adventure he'll never forget! Alec's mom died six months ago, and his world is upside down. Now, it's just Alec and his dad, alone, together but apart. Making matters worse, Alec has discovered that his dad works for a secret government agency that investigates monsters -- real, living, breathing monsters! When Alec joined his dad and the Gonzalezes, longtime family friends of the Kerleys, on what he thought was a short getaway to the Branson, Missouri area, he and his best friend Ken Gonzalez, along with Ken's sister Sarah and her pretty friend Emily, expected to stay in cabins with a swimming pool and a Jacuzzi. What they got instead was a close encounter with a wiggly kid named Ethan Elvis Edgar, who breaks wind whenever he gets scared, and a terrifying attack by a group of the fabled Bigfoots, who are not happy the vacationers are there. And what Alec learns through his experience is that faith and hope and healing can be found in the most unexpected places -- even in the midst of the Terror of Bigfoot. 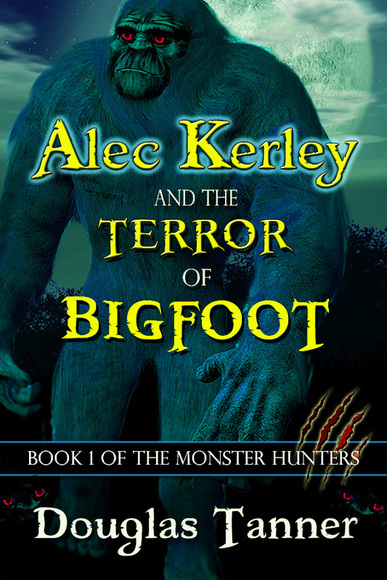 Alec Kerley and the Terror of Bigfoot is a middle grade inspirational horror novel filled with monsters and adventure. It is a legitimately scary story and a great read for all ages -- middle graders, teens, and adults. Parental guidance is suggested. 50,000 words, 22 chapters. Alec Kerley and the Terror of Bigfoot is the first in a series. The other titles are Alec Kerley and the Wrath of the Vampire (Book Two) and Alec Kerley and the Roar of the Dinosaur (Book Three). Terror of Bigfoot Book Trailer from Douglas Tanner on Vimeo.